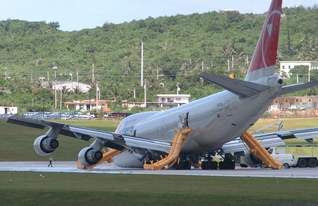 The National Transportation Safety Board released its factual report on the Aug. 19, 2005 accident at the Guam airport, in which a Northwest Airlines flight from Japan landed with its nose gear up. Two passengers were slightly injured during the accident and the plane was damaged beyond repair. According to passenger accounts, the nose of Northwest Flight 74 dropped shortly after landing and the plane started to fill with smoke, prompting an emergency evacuation down inflatable slides. There were 340 people aboard. # the procedures to be followed by the flight crew when there is a problem with landing gear indicator lights. It also notes a similar landing gear problem on that plane earlier in the month. The NTSB still has to prepare a final description of the accident and the probable cause. It isn't known when that will happen. According to a summary of the cockpit conversation, the flight crew aborted the plane's initial landing and got permission to fly in a holding pattern after a red light appeared on a landing gear indicator and a warning horn sounded. After referring to a cockpit operations manual, the captain decided to land the plane after concluding that the landing gear was "down and locked," the report states. The crew's second officer said "good to go," the report states, and the crew's first officer said, "We ran through it and it said gear's down and everybody's happy."